Trawling the online library catalogues available on the internet, we came across an intriguing entry in that belonging to the Bodleian Library in Oxford. In 1791 fall was involved in the re-making of the road to Littleborough using the newly invented methods of Robert Macadam. 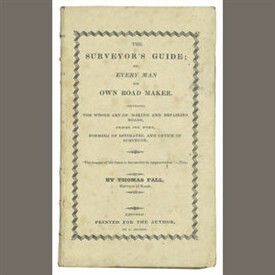 Macadam himself was responsible for the works, but the surveyor and practical engineer on the job was Thomas Fall. So impressed was Fall by the new road-making of which he was a pioneer, that when he had finished the whole section from Littleborough to Worksop, he wrote his book to pass on the skill to others. “We consider the little work before us may be consulted with advantage and the list of respectable subscribers will furnish a voucher of the estimation in which the writer is held, as a practical man, in the country where he is known. We therefore can confidently recommend the work to our readers”. To date this is the sum total of information we have found about this forgotten Retfordian. Perhaps other users of this website know more….? This page was added by Rewind Retford on 26/02/2013. A copy of this book is held at Retford Library - Local Studies (Special Collections).